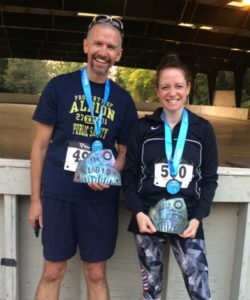 The power of the Albion community and the surrounding area was in full-force for the final Run Albion event, Forks 5K/10K, on September 16, 2017. 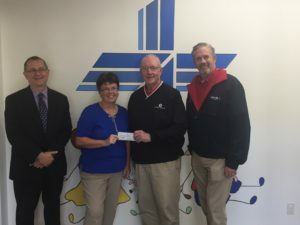 As with previous events, the Forks 5K/10K benefits a local Albion community organization, Little Lambs of Jesus Preschool & Childcare Center, while also continuing its mission to bring the community together through healthy activity. Little Lambs provided many volunteers to help runners not only park and find their way to registration but cheer them on along the course all the way to the finish line. As with previous Run Albion events this season, the course highlighted the best parts of Albion including the parks, waterways, downtown and college campus. Series awards for the 2017 season were given out after the final event and Schuler Arts, one of the other amazing features of Albion, highlighted its artists with their custom Run Albion trophies. Next year the Run Albion team is looking forward to taking advantage of newly renovated brick Superior Street. The sponsors of Run Albion, Bill Dobbins owner of Caster Concepts, Craig Carrel owner of Team 1 Plastics, and Scott Evans, President of Homestead Savings, presented a donation to Little Lambs of Jesus Preschool & Childcare Center on October 17, 2017. Little Lambs of Jesus Preschool & Childcare Center provides high-quality child care for infants up to children 12 years old. Little Lambs focuses on the spiritual, social, emotional and intellectual development for the children of Albion and the surrounding communities. Plans are in the works for the 2nd Run Albion season in 2018, including pounding the bricks down our main street. Stay connect with us on Facebook or Instagram so you won’t miss the dates of the 2018 series.